Love a large entertainment center? The rear entertainment floor plan is a must! This floor plan maximizes the size of your entertainment center storage and includes a large screen TV. Want a true entertainment center with a large TV and more storage? Check out rear entertainment floor plans! These floor plans position the entertainment center in the rear of the RV, with storage along the back wall. In some destination RVs, you'll even find extra mantle space, a fireplace, and hydraulics to lift/lower your TV. The power lift allows you to choose between enjoying the view of the great outdoors from your large rear windows or relaxing to a great show or movie. If you have children, entertain guests often, or are a movie/TV enthusiast, this floor plan delivers! 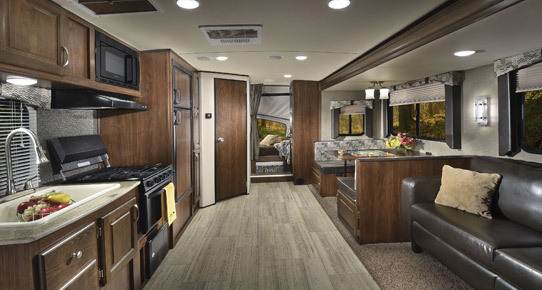 Many types of RVs offer rear entertainment floor plans, including travel trailers, 5th wheels, and destination RVs. 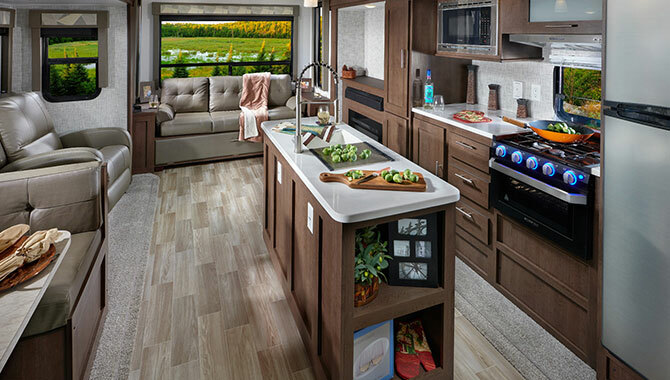 Shop our online selection of RVs with rear entertainment floor plans at your convenience or visit our dealership to see your favorite models in person.